When you’re running an online business staying on top of your revenue and conversion rates helps you gauge the effectiveness of your marketing and sales strategies. 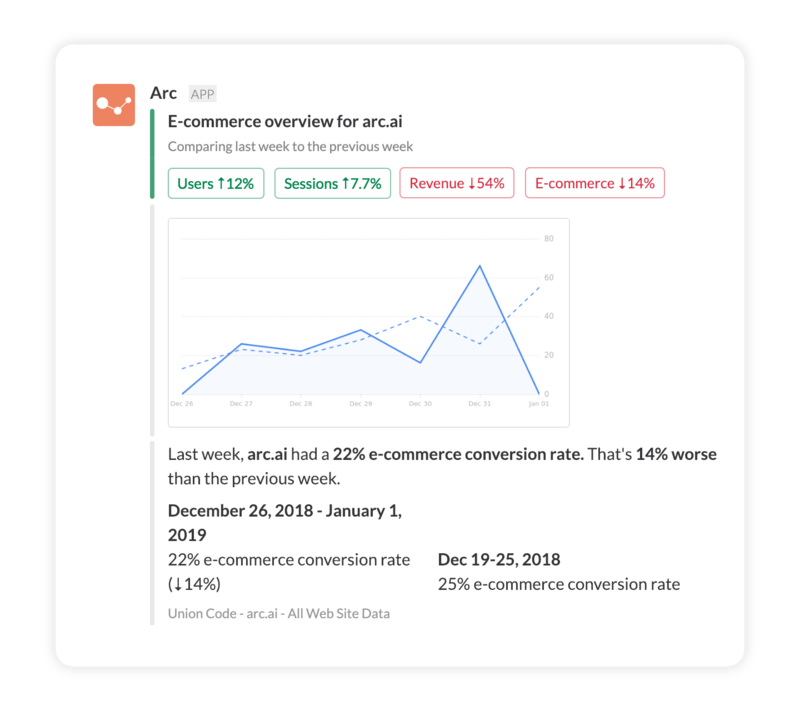 Arc shares e-commerce metrics and charts with your Slack team so you can see everything you need to know about users, sessions, revenue, and e-commerce conversion rates. Arc delivers data and simple charts so you and your team can see conversion and revenue trends. If things are looking up, take some time to enjoy it. If things are starting to trend down, it may be time to adjust your strategy! To set up an E-commerce Overview summary, log in to Arc and either add a new or edit an existing summary. Once you’ve got your Google Analytics account and Slack channel set up you can choose E-commerce Overview from the Shown as drop down. You should now see a preview of the new E-commerce Overview! So that’s how Arc provides a clear view into your e-commerce metrics! Another small change with a big impact 👊.